This is an information page for Faux Paw guildies - providing things such as useful links for guildies as well as the history of our guild - as well as a listing of its members. For in-depth information we're too lazy to record here, you can view the guild's summary page on EQ2Players. The guild's EQ2Players page can be found here, along with the guild forums. 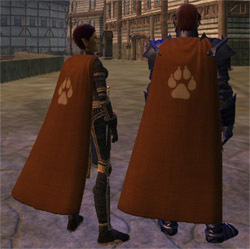 Guild members who aren't currently in the game, but would like to chat with guildmates on Norrath can use our guild chat. The web address for our website is fauxpaw.net. Faux Paw was the creation of Freeport-defector, Ghia Firepint, and the rebel wood elf, Najo Hanuman. They ruled the guild for half of the first year, when they signed over leadership duties to Nysa Nightwind and Cenalorn Rayneblade. Ghia and Najo remain active members in the guild, but are now - without the hassles of running a full-time guild - able to spend more time working in the background; something they are both more comfortable with. Ghia, the guild site's webmaster, is constantly at work on her Fixmajigitweaver MX that helps her maintain the site in a more timely, and professional, manner. Najo, the writ-aholic, after retreating for a time to Elddar Forest for meditations with the masters on ways to be even more effective at churning out writ quests, has returned to slay the denizens of Norrath in the name of Faux Paw. These are the totally cool members, including officers, of the guild, Faux Paw, on the Guk server. You can also view the EQ2Players guild roster, which is likely more up-to-date with levels and specific member-info than the one on this page.